(CNSNews.com) - Moments after repeating his call for the resignation of Virginia Gov. Ralph Northam, Sen. Sherrod Brown (D-Ohio) declared on Sunday that President Donald Trump is "racist." Brown pointed to "news reports" and books to back up his claim. 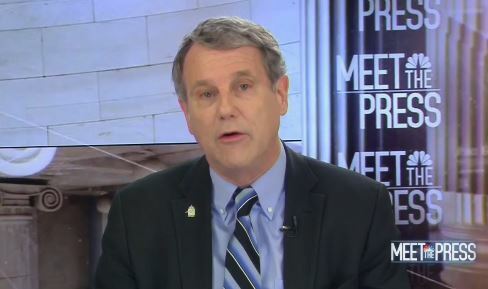 Chuck Todd, the host of NBC's "Meet the Press," asked Brown why "folks" such as Gov. Northam "are now being held accountable for blackface." "Well, I think this country hasn't dealt well with the issues of race," Brown said. "I mean, we have a president who's a racist. Who we have, you know--"
"Let me pause you there," Todd interrupted. "You believe, in his heart, he's a racist?" I know that he built his political career, knowing what he was doing on questioning the legitimacy and the birthplace of the president of the United States. I know, early, and we -- there have been all kinds of news reports about what he did early in his career on housing. We know -- I mean, read The New Jim Crow by Michelle Alexander. Read The Color of Law, about housing discrimination and decades and decades and decades of housing discrimination. And we know that the Trump family, including the now-sitting president, played to that and deepened that.